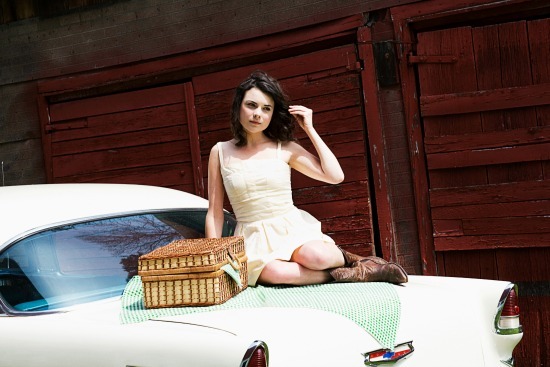 Since storming onto the Toronto singer-songwriter scene in 2011, Whitney Rose has endeared herself to just about everyone with her songwriting, authentic country voice and throwback style influenced by Patsy Cline and Kitty Wells. Here Whitney tells us about her travels across Canada and her perfect food day. Favourite dish: Peanut butter and banana on a good multigrain bread, toasted. Favourite restaurants: VV's, Amico's Pizza in Parkdale and The Whippoorwill in Bloordale. Hidden talents: I can spin around for ages and never get dizzy. Or at least if I get dizzy it's a sensation I like, or something. If my kitchen could talk, it would say: You're the reason for my abandonment issues. Last place I travelled: Western Canada. In a van. With four boys. Best thing about Canada: Diversity. In the land and in the people. Gets me every time. In life, what is most important to me is: Simplicity. Breakfast always starts with a big glass of water. Then comes coffee with a little steamed milk and toasted multigrain bread with banana and either almond or peanut butter (open faced). I generally snack throughout the day and that's often contingent on the season. At the moment, for example, I'm eating lots of local apples. Cortland is my favourite. My perfect dinner is easy: protein and vegetables. I've never met a meat I didn't like. I'm a big fish gal, so pairing good fresh meat or fish with a few different shades of veggies always puts a smile on my face. My motto: You're the boss, apple sauce. Catch one of Whitney Rose's upcoming shows and stay tuned for more Canadian tour dates.